When I lived in California, I wasn’t really a fan of Mexican food, probably because it was too hot for my untrained taste buds, but these breakfast tacos I definitely could get into. Lots of egg, bacon, potato, avocado and queso fresco heaped on a hot flour tortilla. Back in the day, I topped them with a few drops of salsa. Now it’s with a few generous spoonfuls. Two tacos will hold you through to lunchtime. They’re really filling, and delish of course. Start by gathering your ingredients. You will need 8 eggs, 8 strips of bacon, 2 waxy potatoes, 6 ounces of queso fresco, 2 avocados, 1 red onion and 8 flour tortillas. 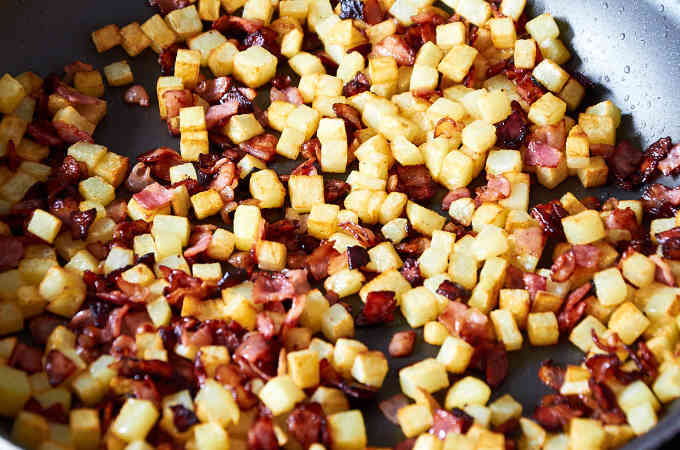 Dice the bacon and fry it over medium heat until nicely browned. 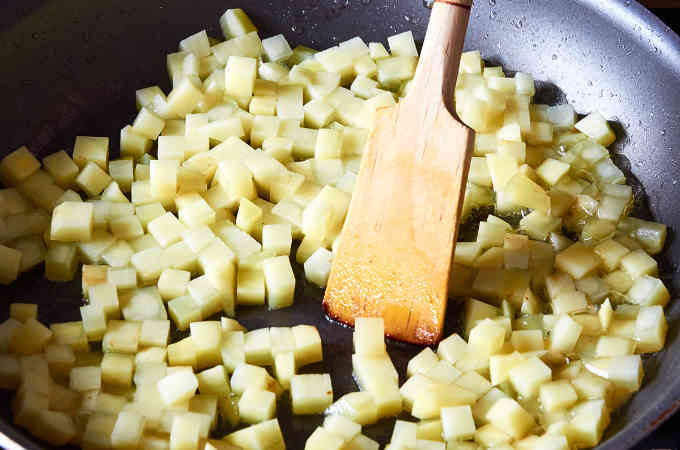 Once it is browned, remove and set aside. Peel and dice the potatoes. 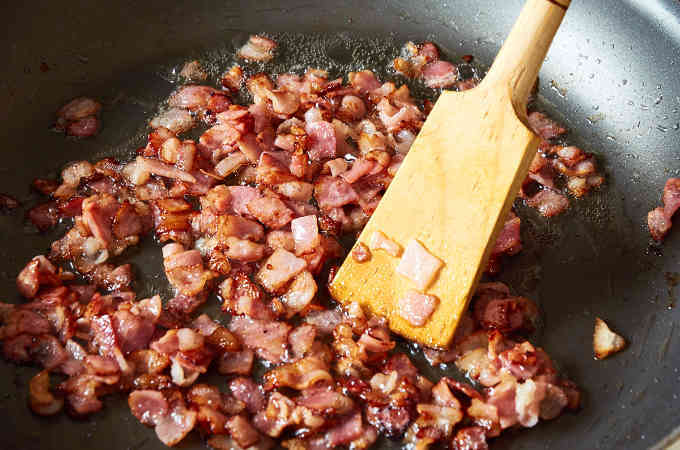 Cook in the fat that remains in the pan from frying the bacon. 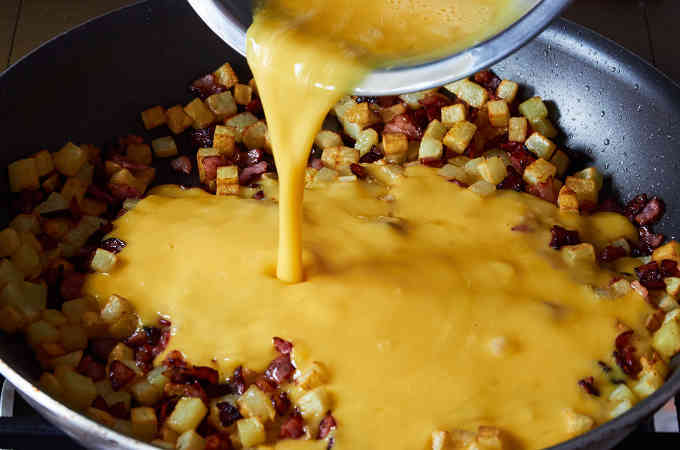 Once the potatoes have browned, add the bacon back into the pan. Beat the eggs and pour them into the pan. When they start to set, turn the eggs until they are just cooked through. Break up the eggs with a spatula. While the eggs are cooking. Heat the flour tortillas in a dry pan until they start to puff up and brown. Some people I know, heat their flour tortillas in the microwave which is not the ideal way to warm tortillas. Don’t do it. You want to heat them in a pan. Lightly browning them makes the flavor authentic and the texture is far superior. Microwaving gives them a mushy chewy texture. 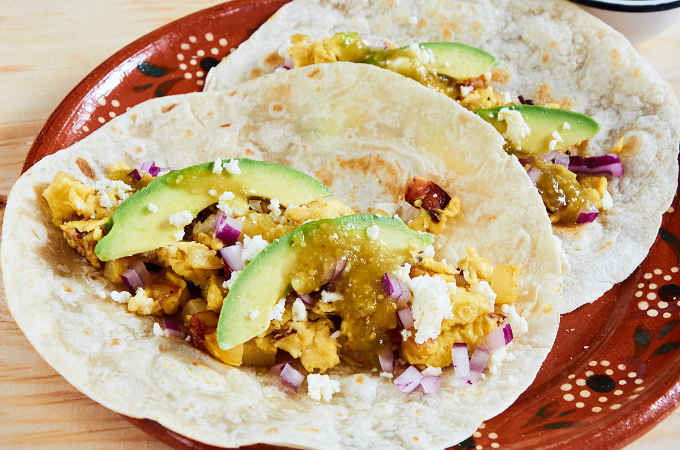 Spoon the cooked potatoes, bacon and eggs onto a hot flour tortilla. Top with crumbled queso fresco, diced red onion, 2 or 3 slices of avocado and a few spoonfuls of your favorite salsa. We recommend these: salsa verde, restaurant salsa, salsa roja, or the habanero salsa if you like it hot. 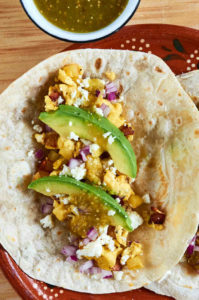 California breakfast tacos with egg, bacon, potato, avocado, queso fresco and red onion on hot flour tortillas. Tasty, filling and easy to prepare. While the eggs are cooking. 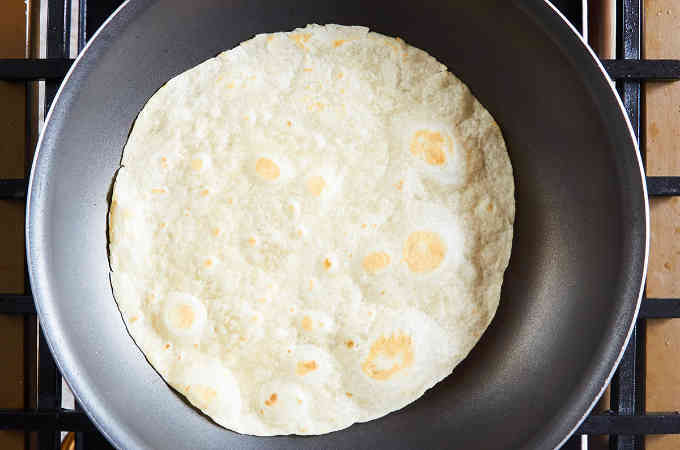 Heat the flour tortillas in a pan until they start to puff up and brown. 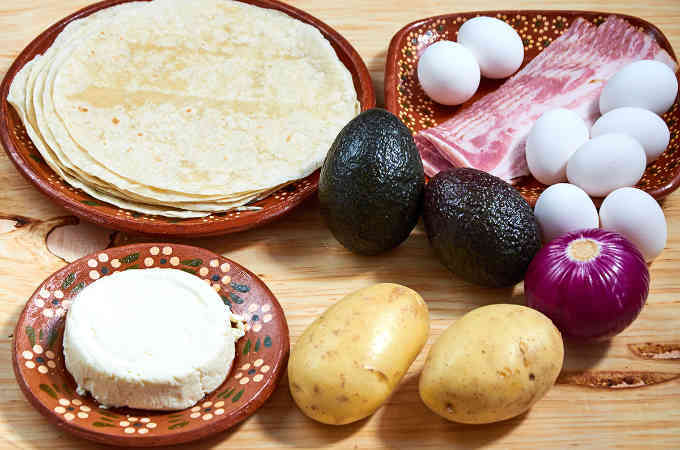 Spoon the cooked potatoes, bacon and eggs onto a flour tortilla. Top with crumbled queso fresco, diced red onion, 2 or 3 slices of avocado and a few spoonfuls of your favorite salsa. You can substitute 6 ounces of Mexican chorizo for the bacon.